One of the hardest parts of being a horse trainer. As my career has grown over the years the challenges have changed. There were difficulties in the beginning as we were newly married, starting a new business and having kids…all at the same time. I get tired just remembering it. There have been challenges of almost every size, shape and color imaginable; tractor break downs, lack of money, disappointed customers, spreader break downs, shortage of money, injuries to horses and humans…the list could go on and on. Thankfully as our business has grown, as well as our ability to budget and plan much of this has improved. We can now predict the future in many cases…tires without tread blow more often…so we plan better. But one area has gotten worse. I can see potential in horses better. And it makes it hard. While this should be an asset, and it is for the most part, it is also a difficulty. 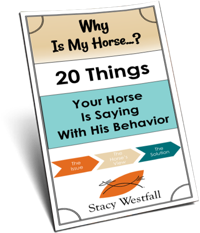 I am addicted to horses and I like to train them. I can see the potential in a mini and enjoy that process as much as the potential in a reining horse. Some people would say, “Train the reiner, it will be worth more in the end” but I see the horse as an individual more strongly than I do as a profit margin. If buying and selling horses was my business I would have gone broke years ago as I value a good home higher than the highest bidder. While I have had to pass on the opportunity to own and/or train several horse in the months after selling our house the reality is that there will never be enough time for me to train all the horses I wish I could. Instead I must have faith that there are other good people out there who will offer these horses opportunity. Stacy recently had the opportunity to work with All Names Taken, an off the track Thoroughbred. Al is currently available for adoption from New Vocations Race Horse Adoption Program. ← Do you decorate your horse barn for fall? Recently I had a bad accident with my potential world contender horse. We had been showing for about a year and doing very well on the local circuit. She spooked at the last show I was competing in and went up. I fell off and she lost her balance and landed on me. I was in the hospital & rehab about 1 1/2 months. I am now trying to decide what to do with her as I am not comfortable riding her. She is a western pleasure mare with a great bloodline and a nice mover. She has lots of potential but of course I have lost my confidence. My trainer in Ocala wants her back and has offered to continue showing her. I feel she needs to start over from the ground up which is not what a lot of breed trainers do. What would you suggest? Thats tough. I hope you heal up well. The mental part will be big too. 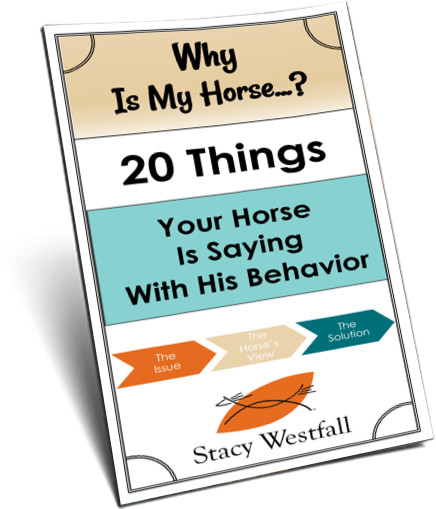 You will know your horses history better. 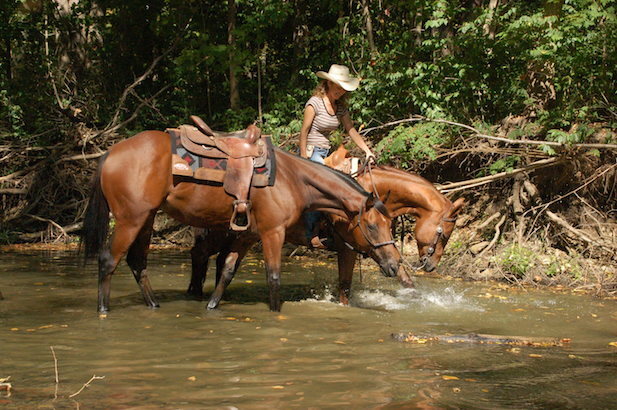 It is common for ‘show’ horses to lack the same foundation that a non-show horse would have. I always do both. Showing in a specific class is great but I also want to be able to act like a 12yr old kid might need to ride them and do crazy stuff with them…kiddie pools, tarps, trail rides, etc. It has been so hard for me to meet up with horses and assess them for people- then tell them, “No, I don’t think this is the right horse for you.” Today I met a horse who has potential, who I think could become a great horse for the right person. The girl who wants this Morgan mare is not the right girl for the horse. It wouldn’t work out. I told her that, and I explained the reasons why, so we’ll see what goes on with that. I think that’s been one of the hardest things for me in helping train horses and teach people horsemanship. So what is Al’s strength going to be in? I hope that you are still considering doing some clinics too. I would love to come see one. This is so true Stacy, I am still in the exhausting moving to new area, raising kids, building the business part of my life. But I am also addicted to training and fixing horses as well as often find it hard to make the decision to walk away even when you see the potential or let the ones who have come so far be taken to another home, but like you said you have to have faith in the people who are buying them. I also believe in good home and right person over top dollar as well! Great article! At times there seems to be more bad trainers than good trainers. There seems to be more good horses still going to slaughter opposed to them finding good homes. If I could retrain race horses and find them good homes every day… I would give up just about everything to do that. I feel like there are so many people who spend more time training competition horses (which is understandable because that’s where the money is) instead of retraining that pony for a young girl who just wants to ride and be safe. What you do is an amazing thing and it’s amazing to see that you still have that mindset because I’ve seen too many trainers start to lose it. It’s about the horse, it’s never about the money. In the end, you can’t take the money with you right? Just the memories. Stacy…I feel the same way. I fall in love with potential. Racehorses have heart…it cannot be denied. It is very hard for people to see with so many behavioral issues stemming from track life. You are a kind person for seeing value in a horse that others would throw their nose up at. When I was a kid, my folks owned a stockyard. Off the track horses would come through all the time. As a child all I could see was the beauty, hell that’s all I see now. Needless to say, they would often sell for little or nothing. So, I had my share of rehabilitating these horses. Yes they had their problems, but like every horse I’ve known once I’d reach in and turn the knob they open doors I never thought possible. Good on you for taking the time to write this. The article gave me some fond memories of horses past. Happy trails.